For its many aficionados around the world, fly fishing is a soothing pastime that allows them to attune with nature while enjoying the great outdoors. Fly fishing vacations in Montana offer access to stunning scenery and to some of the best rivers for fly fishing in the country. If you have never been fly fishing before but are curious to try, the guide below will give you an overview of how it works. There are many different fishing methods used by individual fisherman around the world, such as netting, spearfishing, hand gathering, trapping, and angling. Fly fishing is a subset of angling: the fish are caught when they bite down on a metal hook. The hook is attached to a fishing line, which is in turn attached to the fisherman’s rod and reel, which he or she uses to bring the fish in once it has been caught. Many angling methods use bait such as dead fish matter or live worms to entice fish into biting the hook. Fly fishing, however, is different. Instead of bait, the fisherman relies on the key piece of fly fishing gear: the hand-tied flies themselves. These objects, made from elaborately knotted and tied string, attract the fish. Some mimic the look of insects and other organisms that fish eat for food, while other simply attract fish through their color and motion. The fly fisherman’s central skill is casting. Using fly fishing equipment that includes weighted fishing lines and special fly fishing rods, the line is cast out over the water in one fluid motion. 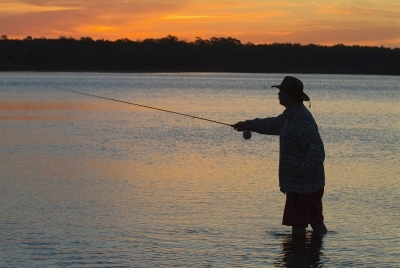 Fly fisherman practice their different types of casts, just like golfers practice their swings. For optimal casting, you often have to wade out into the middle of a river or stream, so a good pair of waders are essential. After casting, the fisherman waits for fish to bite while enjoying the beauty of the surrounding countryside. He or she may move several times over the course of one day before finding optimal fishing conditions.